Other Iraqi culinary essentials include olive oil, sesame oil, tamarind, vermicelli, tahini, honey, date syrup, yogurt and rose water. Lamb is the favorite meat, but chicken, beef, pork (despite the majority of the population being Muslim), goat and fish are also eaten. Most dishes are served with rice – usually timman anbar, a yellowish, very aromatic, long-grain rice grown in the provinces of Anbar and Qadisiyyah. Bulghur wheat is used in many dishes, having been a staple in the country since the days of the Ancient Assyrians. Flatbread is a staple that is served, with a variety of dips, cheeses, olives, and jams, at every meal. Various stews served over rice form a major part of Iraqi cuisine. A feature shared with Iranian (or Persian) cuisine (see Khoresht). 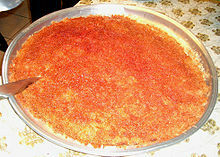 A typical Iraqi Kleicha, a national Iraqi cookie. Luzina is a candy similar to Turkish Lukum, made from ground fruits. ^ a b c d e f http://www.thingsasian.com/stories-photos/3592 Foods of Iraq: Enshrined With A Long History. Habeeb Salloum. ^ a b c d e f Albala, Ken (2011). Food Cultures of the World Encyclopedia. ABC-CLIO. pp. 251–252. ISBN 978-0-313-37627-6. ^ a b c d Davidson, Alan; Jaine, Tom (2006). The Oxford Companion to Food. Oxford University Press. p. 405. ISBN 978-0-19-280681-9. ^ a b "History and Agriculture of the Pistachio Nut". IRECO. Archived from the original on 13 July 2006. Retrieved 27 February 2012. ^ a b c d Lawton, John. "Mesopotamian Menus". Saudi Aramco World, March/April 1988. Saudi Aramco. Retrieved 30 March 2012. ^ a b c d e f Marks, Gil (2010). Encyclopedia of Jewish Food. John Wiley & Sons. p. 585. ISBN 978-0-470-39130-3. ^ Nasrallah, Nawal (2003). Delights from the Garden of Eden: A Cookbook and a History of the Iraqi Cuisine. 1stBooks. p. 221. ISBN 978-1-4033-4793-0.